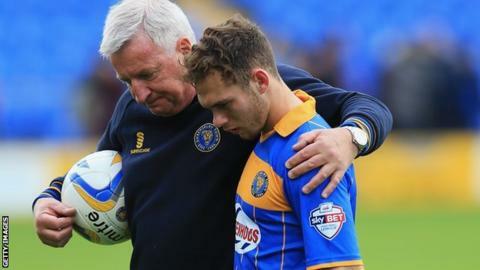 Shrewsbury's two-year spell in League One ended after losing to Peterborough United, who secured a play-off place. Jon Taylor headed Shrewsbury in front but Conor Washington levelled soon after with a shot from inside the box. Washington fired past Town keeper Chris Weale to make it 2-1 before Lloyd Isgrove added a third from close range. Tom Bradshaw's strike reduced the deficit but, after Britt Assombalonga missed a penalty for Posh, Josh McQuoid nudged in a fourth. Shrewsbury needed a win to stand any chance of staying up and looked to have a glimmer of hope with Taylor's early goal. But Posh rallied to go into the play-offs, as they look to make an instant return to the Championship. "Obviously I am devastated. I knew it was going to be a tall order. We showed a lot of spirit and fight. We have been unbelievable with determination and desire when defending. "A few players have come out with a bit of credit and this club has the opportunity now to start building for the future. "We can't let what has happened this season happen again - we have to build, big time. We have a lot of loan players and we lack the quality to compete at this level. "With the right guidance some of our players will compete at this level again - but we have to be inspired to bring in players with pace, power and a lot more quality." "I thought it was obviously a really poor start, but from that moment on I thought we were outstanding. "The two goals we lost were really poor and that's the Achilles heel. "We've got to have more desire to stop balls going into the box, I mean I've just said to the players it's not rocket science, if you keep clean sheets you win. "We were in complete control, some of the football was outstanding, we were creating chances and on another day, it really could have been a large score." Match ends, Shrewsbury Town 2, Peterborough United 4. Second Half ends, Shrewsbury Town 2, Peterborough United 4. Goal! Shrewsbury Town 2, Peterborough United 4. Josh McQuoid (Peterborough United) right footed shot from the left side of the box to the bottom right corner. Assisted by Nathaniel Mendez-Laing. Substitution, Peterborough United. Grant McCann replaces Nicky Ajose. Kgosi Ntlhe (Peterborough United) wins a free kick on the right wing. Foul by Asa Hall (Shrewsbury Town). Nathaniel Mendez-Laing (Peterborough United) wins a free kick in the attacking half. Corner, Shrewsbury Town. Conceded by Mark Little. Corner, Shrewsbury Town. Conceded by Michael Bostwick. Aaron Wildig (Shrewsbury Town) wins a free kick in the attacking half. Substitution, Peterborough United. Josh McQuoid replaces Conor Washington. Substitution, Peterborough United. Nathaniel Mendez-Laing replaces Lloyd Isgrove. Asa Hall (Shrewsbury Town) wins a free kick on the left wing. Attempt missed. Kgosi Ntlhe (Peterborough United) right footed shot from the left side of the box is close, but misses the top right corner. Substitution, Shrewsbury Town. Asa Hall replaces Luke Summerfield. Attempt missed. Luke Summerfield (Shrewsbury Town) right footed shot from outside the box misses to the right. Attempt missed. Kgosi Ntlhe (Peterborough United) header from the centre of the box is too high. Corner, Peterborough United. Conceded by Ryan Woods. Corner, Peterborough United. Conceded by Chris Weale. Attempt saved. Nicky Ajose (Peterborough United) right footed shot from the left side of the box is saved in the centre of the goal. Attempt saved. Tommy Rowe (Peterborough United) right footed shot from the centre of the box is saved in the bottom left corner. Attempt missed. Jon Taylor (Shrewsbury Town) right footed shot from outside the box is close, but misses to the left. Penalty Peterborough United. Conor Washington draws a foul in the penalty area. Penalty conceded by Dave Winfield (Shrewsbury Town) after a foul in the penalty area. Jermaine Grandison (Shrewsbury Town) wins a free kick in the defensive half. Corner, Shrewsbury Town. Conceded by Jack Baldwin. Corner, Shrewsbury Town. Conceded by Robert Olejnik. Foul by Tom Bradshaw (Shrewsbury Town).